The documentary in co-production with Dutch IKON-TV portrays the daily reality of a midwife, living and working in Amsterdam. These are the words of Imke Rosink, the midwife that is at the centre of this film. We see her at work with two of her colleagues in their local practice, conducting pre-natal and post-natal checkups, attending births at home and in the hospital. We follow her at the Amsterdam Dapper market, where she feels at home in the lively neighbourhood of diverse nationalities, all bringing their own traditions of pregnancy and childbirth. The practice’s consultation hours are posted in three languages and in the waiting room mothers-to-be of all backgrounds are waiting. Some persistent misunderstandings exist about midwives: they are not assistants of the family doctor, nor do they serve as subordinates of the gynaecologist. Midwives are self-regulating professionals requiring extensive medical qualifications related to all aspects of pregnancy, who assist at deliveries without complications. Compared with other western countries, this is rather exceptional. 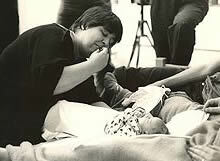 The practice of the midwife used to be a one woman affair, but more and more women now work together in group practices. Although home birth rate has declined steadily since the mid 1960s, approximately 30% of women in the Netherlands still give birth at home, a larger number than in other European countries. A recent 7 year study of more than half a million low-risk Dutch women compared mortality in planned home and planned hospital births. The study clearly showed that a home birth does not increase the risk of perinatal mortality among healthy women. Unfortunately even in The Netherlands, the independence of midwives is threatened by the unnecessary medicalisation of pregnancy and birth. The film shows how the Dutch midwife has been able - up to now - to maintain her unique and independent position. All these pregnant women with their different traditions, questions and desires; how does the midwife balance these forces? Midwife Imke gives us a clear and sometimes moving insight in the practice of her life.